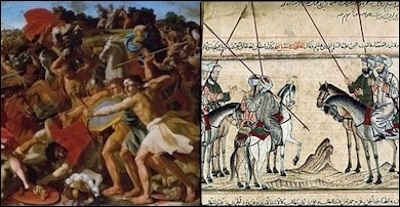 Is the Christian Bible More 'Bloodthirsty' than the Quran? Originally published under the title "'Scientific' Claim: Christian Bible More 'Bloodthirsty' than Quran." Left: Joshua's Victory over the Amalekites (Nicolas Poussin). Right: The Battle of Badr (14th century Alkhanid drawing). A new data-based study published on Yahoo News, Huffington Post, and many other media, purports to have proven that the Bible—including the New Testament—is more violent than the Quran. But a recent project by data analyst and research marketer Tom Anderson turns one common misconception on its head: that the Quran is more consumed by blood thirst than the Christian Bible.... Of the three books [Old Testament, New Testament, Quran], the project found, the Old Testament is the most violent, with approximately 5.3% of the text referring to "destruction and killing" — the Quran clocked in at just 2.1%, with the New Testament slightly higher at 2.8%.... According to Anderson, the findings challenge the popular notion among Westerners that Muslims subscribe to a particularly violent faith. Indeed, he concluded, "of the three texts, the content in the Old Testament appears to be the most violent." So this study proves what Islam's apologists have long claimed: that the Bible contains more violence and bloodshed than the Quran. Even so, the intelligence and/or sincerity of anyone—including supposed scholars and "thinkers"—who cites this fact as proof that the Quran cannot incite more violence than the Bible must be highly doubted. Most violence in the Bible is recorded as history; most violence in the Quran is doctrinally significant. This study also fails to consider who is behind the violence. It just appears to count the number of times words like "kill" appear. Due to this, New Testament descriptions of Christians—including Christ—being persecuted and killed are supposedly equal at inciting Christians to violence as Allah's commandments for Muslims to "slay the idolaters wherever you find them—seize them, besiege them, and make ready to ambush them!" (Quran 9:5). This study sees no difference between the martyrdom of Stephen (Acts 7-8) and Allah's words: "I will cast terror into the hearts of those who disbelieved, so strike [them] upon the necks and strike from them every fingertip" (Quran 8:12). This is to say nothing of the fact that Islamic teaching is hardly limited to the Quran; volumes of canonical (sahih) Hadith (words and deeds of Muhammad) equally inform Muslim actions. As one Muslim cleric put it, "Much of Islam will remain mere abstract concepts without Hadith. We would never know how to pray, fast, pay zakah, or make pilgrimage without the illustration found in Hadith..." And as it happens, calls to anti-infidel violence in the Hadith outnumber the Quran's. Due to its many shortcomings, even Anderson admits that his "analysis is superficial and the findings are by no means intended to be conclusive." So why are several media outlets highlighting the conclusion of a study which readily admits it does not prove what its champions claim? Because the politically correct conclusion—that Islam cannot be any worse than Judaism and Christianity—is all that matters here, gaping holes in methodology be damned.